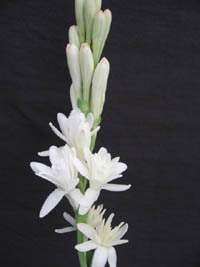 Tuberose are bulbs from Mexico that produce short grassy looking leaves and spikes of white very fragrant flowers. Only the mature bulbs will bloom. 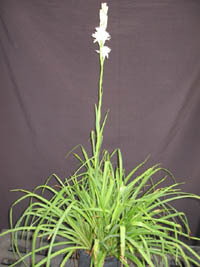 They reproduce fast and with time clumps will have several mature bulbs capable of blooming. The flowers appear primly during late summer to fall. In warmer places flowers can appear anytime from spring through fall. The flowers have a mild fragrance during the day and a strong fragrance at night. 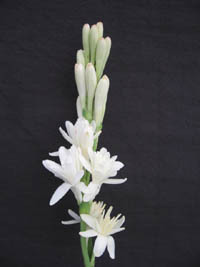 Tuberose are good cut flowers and they are available in a single or double form. They grow in full to partial sun with average water during the warmer months and a little drier during the winter when the bulbs go dormant. They can be planted in the garden in tropical locations, but have to be potted and protected during the winter in colder places. 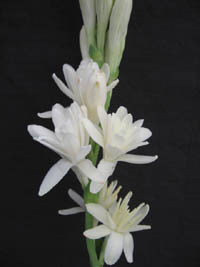 Tuberose can remain outside in places with light freezes if well mulched.